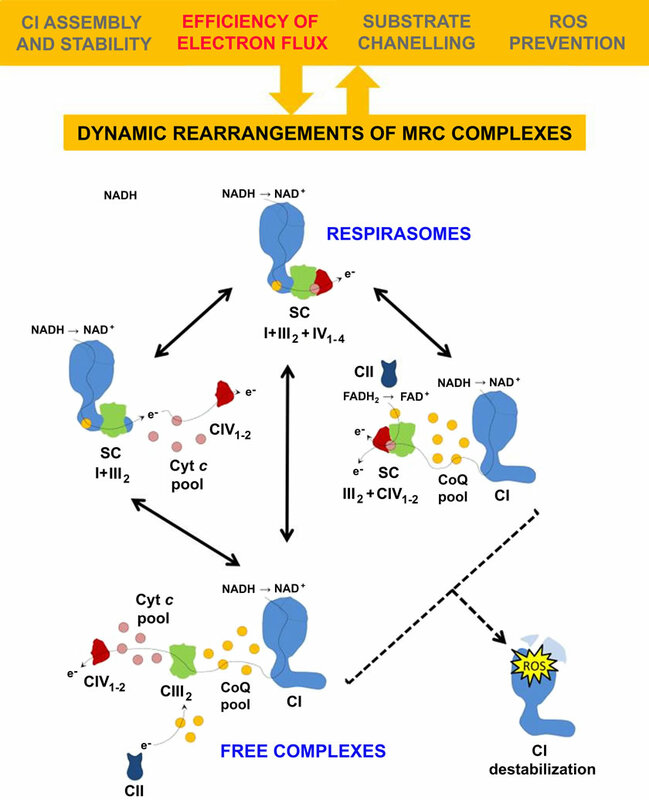 The mitochondrial respiratory chain (MRC) assembly and function involve the organization of its constitutive complexes in supercomplexes or respirasomes. It is believed that supercomplexes have an important functional role in cellular bioenergetics by optimizing electron transfer, proton pumping and controlling the formation of reactive intermediates. We are investigating the players and mechanisms involved in MRC supercomplex assembly using yeast and cultured human cells as research models. In collaboration with Dr. Cristina Ugalde (Spain), we have recently reported the first human mitochondrial respirasome assembly pathway, which involves a paradigm-shifting model. Our data indicate that respirasome biogenesis involves a complex I assembly intermediate acting as a scaffold for the combined incorporation of complexes III and IV subunits, rather than originating from the association of preassembled individual holoenzymes. These studies, published in two Cell Metabolism papers, are shedding light onto the structural interdependences between respiratory chain complexes. Current projects aim to refining the proposed assembly pathway in human cells derived from controls and patients with mutations in respiratory chain subunits and assembly factors, characterizing the role several respiratory chain assembly factors play on respirasome biogenesis and investigating how the pathway is regulated by oxygen tension and oxidative stress.